Bunches of Other Stitches - Bead It! What an interesting stitch! What's really nice is that when you learn the basic technique it is extremely easy to adapt it to different bead counts and styles, we love the versatility. Sign up for a class and decide which style you want to make from our samples when you get here! We will use several colors of 11/0 seed beads, 3mm crystals, pearls, or fire-polished beads, depending on the style you choose. Using 3mm and 4mm Swarovski pearls, 4x3mm rondelles, and four colors of 11/0 seed beads, you too can create this regal affair! A twist on Albion stitch! Learn how to crochet a bead tube in this two-part class. Come with your size 8/0 seed beads pre-strung on jean stitch, and our teacher will get you on your way! After some homework, come back to learn how to join your bangle bracelet and start a new project! By appointment only, please contact us! Totally easy and fun, this simple stitch can be used with any beads. The more strands the better! This is the easiest Bead Crochet you can do. Learn to create any shape or pattern with beads! We will bead around a bead with peyote, then embroider any beads your heart desires, incorporating many colors, sizes, and shapes. Really, anything goes. 11/0 seed beads and Delicas are really great, especially for beading around a cabochon. There will be some homework, depending on the size of your piece, it can take a while. When the beading is done you will come back to learn how to seemlessly finish the back. Create these fun beads with the new two-hole "Brick Beads". Learn to alter bead counts to create matching beads in different sizes. This is a new stitch to us! Kind of a cross between herringbone and netting ... it works up amazing with drops ... they pop out of the bracelet with ease. Using 11/0 seed beads, learn to create one, two, or all three versions of Chevron we offer! This dainty stitch creates a great bead chain. This beauty is perfect for Spring. Another new design by Donna, our bead Queen! Another cool creation by Donna! This is definitely her month ... very fancy with Superduos and 3mm Fire Polished beads. Donna designed this sweet bracelet ... delicate on it's own or perfect for stacking! 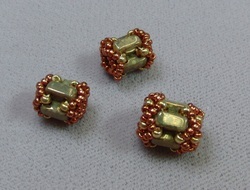 Learn how to create beaded clasps using Herringbone Stitch, Peyote Stitch, and Square Stitch. Beading your own clasp finishes off your beadwork in style! This wonderful new stitch by Melanie de Miguel, out of the UK, is proving to be lots of fun! Try it double-drop for a lacier effect. Learn 4 stitches in one class! Using 8/0 or 11/0 seed beads, create an organic rope that's quite unlike any other stitch. Using the two-hole Silky beads, create this whimsical bracelet! This can be done either single or double wide, with a variety of different beads. 11/0 seeds are a great start, incorporate drops, fire polished beads, cubes, whatever catches your eye! This whips up quickly, easily, and makes the prettiest bead chain!